Weekend Getaway: 48 Hours in Sacramento - Get on Board! Sacramento is not only California’s capital city, but also a place people visit to find adventure. One of 17 stops along the Capitol Corridor train route, this hot spot offers plenty of ways to find fun on water and land, and offers a rich Gold Rush-era history to explore. The city has also dubbed itself the “Farm-to-Fork capital,” which hints at the wide variety of edible options available to satiate even the most distinguished palette. What to do with a weekend in Sactown? Here are some of the best places to experience the bustling food, beer, and adventure scene during your 48-hour stay. Start your day off right at the Tower Cafe, which is situated by the historic Tower Theater. Known for having the best brunch in town, the menu offers up incredible French toast with multiple options, a Denver omelette, Mexi-Cali breakfast burrito, and plenty of other delicious items to fuel up for a day’s adventure. The Tower Café is a short cab, Uber, or Lyft ride from the Sacramento Station, or you can take a Sacramento Regional Transit (SacRT) bus. Fox & Goose, about a mile from the train station, is the place to go for a full English breakfast, including eggs, grilled banger, bacon, grilled tomato, and mushrooms, baked beans, and toast. Old Soul Co. is another coffee aficionado’s favorite. This craft coffee bar and bakery offers a number of tasty pastries and brews to enjoy. You can walk there from the train station in about half an hour, catch a cab, Uber, or Lyft, or hop on a SacRT bus. Only a 10-minute walk from the Sacramento Station is Temple Coffee Roasters, which serious coffee lovers always include on any visit to Sacramento. This farm-to-cup espresso and coffee shop features a temple-like ambiance along with good vibes and great coffee. Sacramento is known as the River City, so it’s no surprise outdoor fun here centers around water-based activities. With summer temperatures regularly crossing into the hundreds, getting out on or near the water is a great way to cool off. 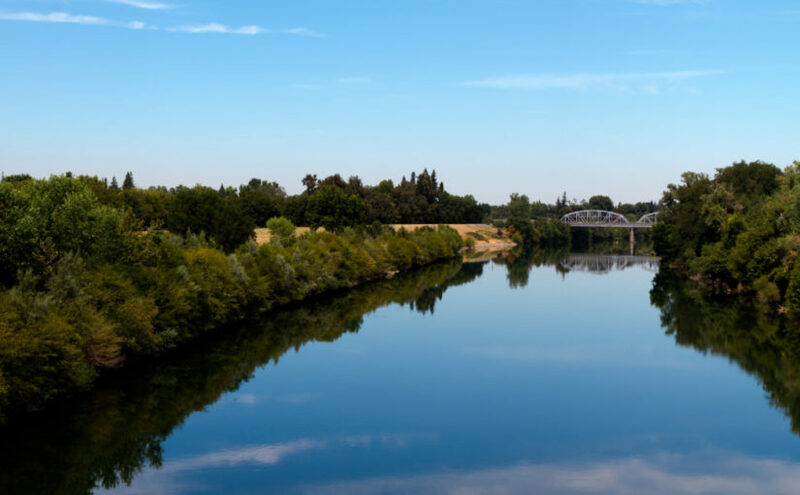 Close to the Sacramento Station, you’ll be able to pick up and pedal along the American River Bike Trail (also called the Jedediah Smith Memorial Trail) for great views of the river. This 32-mile paved route runs all the way from Old Sacramento’s Discovery Park to Folsom Lake. Along the way, you’ll find mile markers, restrooms, and other facilities. Check the map to see what’s available. And since Capitol Corridor welcomes bikes on board its trains, you’ll be able to go straight from the tracks to the trail! Also near the station you can dip underground for an Old Sacramento Underground Tour offered by the Sacramento History Museum. After extensive flooding in the 1860s and 1870s, the town built itself up higher, leaving fascinating areas underneath that you can explore with a guide. In the hot summer months, this is a great way to stay cool without getting wet! If you’re spending more time in the Sacramento area and don’t mind renting a car, there’s lots of adventure to find farther afield. Find flatwater paddling along the American River, which can range from mellow riffles to epic whitewater. For a medium-paced Class II adventure, start at the Marshall Gold Discovery State Historic Park North Beach put-in and paddle along a three-mile stretch to Camp Lotus for take-out. Be sure to check with local experts for current conditions and water levels before heading out on the river. If you’re unfamiliar with the river or paddling, you can go with a guide. 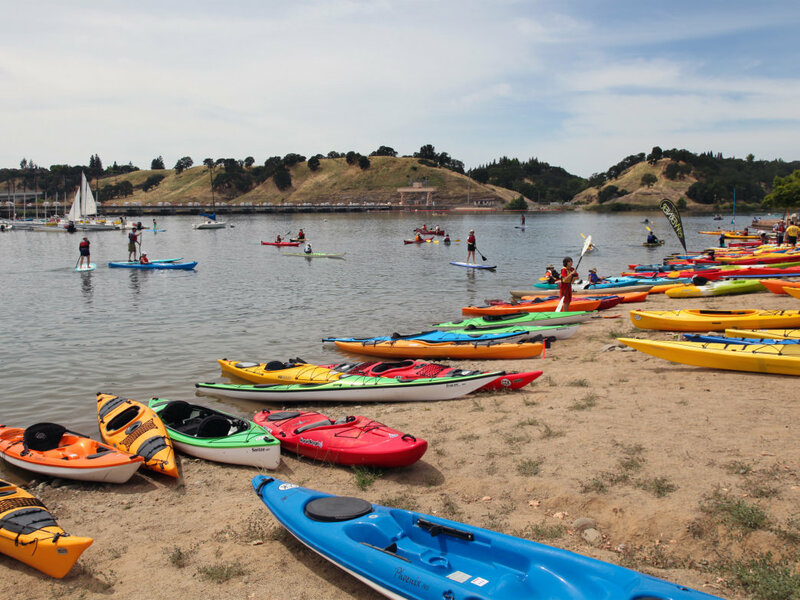 For other water-based fun, head to the Sacramento State Aquatic Center on Hazel Ave. in Gold River (near the Nimbus Dam between Lake Natoma and the American River). The aquatic center is open to the public and you can rent a boat or take a class in stand-up paddleboarding, kayaking, canoeing, sailing, windsurfing, rowing, or a variety of other water sports. Sacramento calls itself “America’s Farm-to-Fork Capital” and it doesn’t disappoint. Situated in a rich, fertile valley, the Sacramento region has long been known for its world-famous produce used to craft bold and inventive dishes. Local foodies flock to special farm-to-fork events, including Taste of Summer, featuring food-inspired events throughout Sacramento in June and the popular Farm-to-Fork Festival that takes place on the Capitol Mall in late September every year. This free, three-day event includes delicious local offerings, interactive booths, cooking demos, live music, kids’ activities, and more. 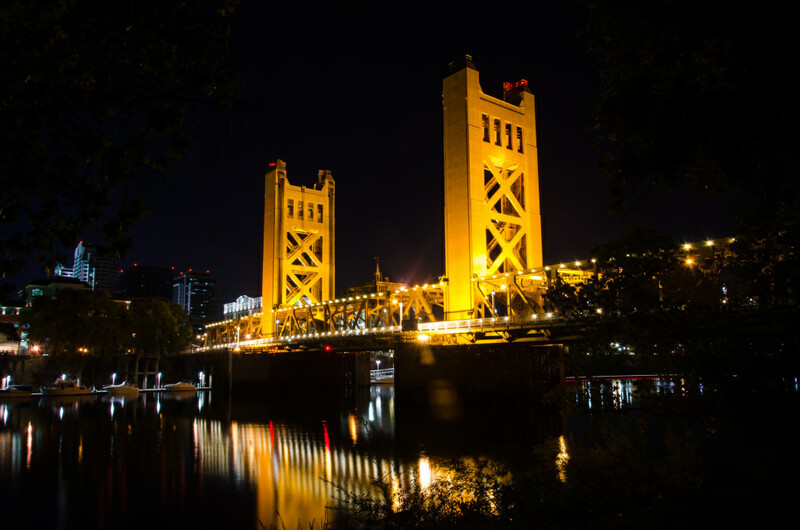 The culmination of the season’s foodie activities is the Tower Bridge Dinner, where hundreds of guests enjoy a locally sourced, family-style feast on Sacramento’s iconic Tower Bridge. Sacramento is packed with farmers’ markets in various neighborhoods around town. You can find a farmers’ market to quench your appetite for farm-fresh fare five days a week or indulge in farm-to-table offerings at the local restaurants. If you are looking for a more international flavor, Sacramento is still a great spot. The city was once named America’s most diverse city, and you can find just about any type of cuisine here. Indulge in Mexican, Japanese, Chinese, Thai, Vietnamese, Ethiopian, Afghan, or a wide range of other cuisines during your stay. Cafeteria 15L is a local downtown favorite on 15th St., that offers peach and tomato bruschetta, roasted chicken and berry salad, Thai steak salad, fish and chips, and many other options. The Waterboy is a Midtown favorite and features a menu inspired by northern Italy and southern France. Enjoy skirt steak, herb ravioli, fish specials, leg of lamb, and more. You can get to both of these restaurants on SacRT, or by catching a cab, Uber, or Lyft. In Old Sacramento near the train station, head to Rio City Cafè with alfresco riverside dining for brunch, lunch, or dinner. Enjoy the Ahi Tuna Caprese or Santa Fe Chicken Salad among other options. Or, dine at the classic Firehouse Restaurant, a mainstay in Old Sacramento since the 1960s. Enjoy sophisticated dishes of seafood and steak, and most importantly, be sure to save room for a treat off the delectable dessert menu. After a day of adventuring, enjoy the dozens of breweries and bars that call Sacramento home. Take in some history along with your beer at the River City Saloon in Old Sacramento, just a five-minute walk from the train station. Built in 1857, it was once a house of ill repute, and dodged the law during Prohibition. Now, it’s a place to try Old West Sarsaparilla, grab a sandwich, and savor a drink while reliving a touch of Gold Rush history. Or hop on a bus and head to Oak Park Brewing Company for weekend brunch, pub trivia, or burger and pint night. Enjoy small plates like Irish fries, Huevos Diablos, and other menu mainstays, or opt for heartier fare like St. Louis spare ribs and bacon bleu mac and cheese. For a different experience, grab a crew and book the Sac Brew Bike for a brew pub crawl adventure. Originally written by RootsRated for Capitol Corridor.